Simply Amazing – He Said What?! Yesterday was D-Day…….the day for Aaron to go to the lab for blood work and for the dreaded urine sample. I wasn’t sure what to expect when I opened his bedroom door and said good morning in a cheery voice. He looked up at me…….and smiled. What a great start! And sure enough, Aaron was in a happy mood as he got up and showered and took his pills…..and wasn’t allowed to drink his coffee or eat any of his strawberry jello that we had made especially for him the night before. Off we drove to the air base, listening to his CD choice…….turning the music off occasionally as he shared yet another observation from all the sights outside the windows of the van. At one point he said, “Mom. I heard Dad walking early this morning in the hall.” I asked him how he knew it was Dad and not me, and he answered, “Because Dad’s footsteps are deeper!” I knew his voice was deeper, but wasn’t aware of his deeper footsteps. Interesting Aaron! We walked into the small lab area at the air base clinic. We passed by the first bathroom in the waiting room. The bathroom door was open, and Aaron………who doesn’t like bathrooms and who REALLY doesn’t like public bathrooms…….lagged behind me. I turned and saw him craning his neck to see inside the dark bathroom. I knew he was scoping it out and that he was dreading what was to come as he had to pee in that cup……..there in that already uninviting restroom. As I checked him in at the counter, I turned again to see what Aaron was doing…….and there was no Aaron. Just then I saw him lean his head slowly around the corner. He had snuck up the hall while I wasn’t looking. When he saw me, he smiled broadly and came around the corner. “I was hiding from you, Mom!” I was thankful that he was just playing a game and that he hadn’t actually run away from that awful bathroom. And thankful that he was still in a good mood! He sat down and slowly answered the technician’s question about his name and birth date. I try to let Aaron answer those questions himself, but he always falters on the date of birth. He’s wondering if he should say 11-8-84 like Mom does, or November 8, 1984 like he’s used to saying. I just waited patiently and so did the tech, and soon Aaron got the date straight and all was well. The first arm that the tech looked at wasn’t going to work, so he removed the tourniquet and stuck Aaron’s right arm. Aaron takes all this in stride, so I walked out and stood outside the door. I looked in once, and suddenly a huge lump appeared in my throat as I looked at Aaron sitting in that chair……….getting stuck yet again……..being all brave, but dreading what to us would the easiest part of this morning…….the pee cup. It was both sad and then funny at the same time, and I had to will myself to think of the humor and to not see my boy sitting there with a needle in his arm……..wondering if he’s all right and praying that his weight loss can be explained by something other than another scary diagnosis. Soon the blood draw was complete and there stood Aaron, holding his sample cup and looking positively uncomfortable. He held back as I walked in the bathroom and turned on the light, but then he stepped inside and listened impatiently to my instructions. Aaron shows anger when he is scared or embarrassed, so he stood there saying, “I know! I know!” as I went over the process……….knowing that he didn’t know but knowing that he was just ready to get this over with…..NOW! Then he asked, “Mom, you’re not staying in here, are you? !” I assured him that I was not, and then I exited the bathroom and sat in the waiting area, hoping that things behind that closed door were going well. It wasn’t long before the door opened and Aaron walked quickly out, happy to be rid of that bathroom and this whole ordeal……….and carrying his full sample cup. So back in the bathroom we walked as I opened the little door and he set the cup inside……..and we were done, at last!! I fully shared Aaron’s relief, trust me! I praised him for doing so well as we drove through the Burger Kind drive-through. He happily chattered on the way home, where he placed his bacon burger on a plate………because he always must have a plate or a bowl on which to place his wrapped food. And you can see in the picture that he also has a spoon, fork, and knife……which he didn’t use but which MUST be there, no matter what he eats………and his napkin holder, which he does use…….way too much…….many, many napkins with each meal. 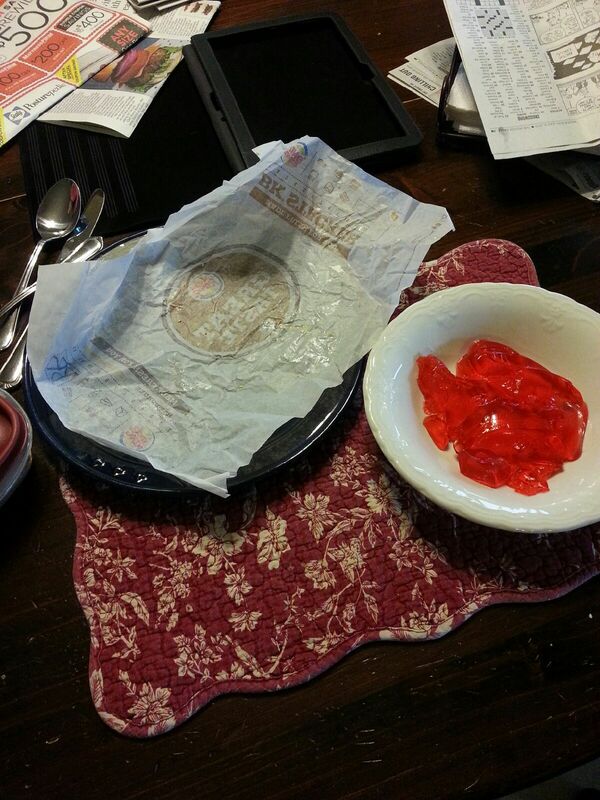 And then the best part……….the strawberry jello!! He watched me spoon it into a bowl, laughing at how wiggly it was. And he enjoyed every single bite! I was glad that we had made the jello the night before so that he could be rewarded for his peeing in the cup ordeal this morning. Such a simple reward, but it meant tons to Aaron. And that’s how Aaron is………..it’s usually the simple things that either frustrate him or make him very happy. The simple things that trip him up or keep him motoring right along. That’s why I can say, for sure, that Aaron is SIMPLY amazing! Previous Previous post: I Will NOT!!! Next Next post: Is It Dusk?